I have a confession to make, and it’s one I’m not particularly proud of: I am a bit of a coffee snob. True, none of the Food Republic's 13 Signs That You're a Coffee Snob apply to me. But still, before we left America I would embarrass Dan by asking waitresses how long ago they had made the coffee. I'd flatly refusing to drink any coffee that had been sitting on the burner for more than 30 minutes. To me, it tasted bitter and burnt. So, for all intents and purposes, I rarely drank regular restaurant coffee. I like to offer at least one useful tip in every blog post, so before I go further, I want to share a tip with my coffee-loving friends: It’s easy to tell if coffee has been on the burner for too long: Just add a bit of cream. If your java turns the color of milk chocolate, it was brewed recently. On the other hand, if the coffee turns gray, it’s too old. One year we splurged on a special Cuisinart coffeemaker that would grind whole beans, then deposit them into a filter before adding hot water at just the right temperature to get the perfect cup. It had a thermos for a coffee pot, which meant the coffee would stay hot for hours. No more worrying about making too much before it started to overcook. We miss this coffee maker. I would begin every morning with a ritual of preparing a pot of hot coffee, fixing a fragrant cupful in my favorite mug, and sitting down for a few moments. Just sitting, staring at nothing, hands wrapped around the mug, fingers warming through its porcelain sides. 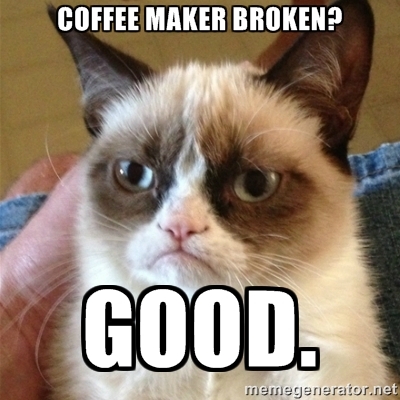 That was a good coffeemaker. When we left the US it was one of the things we most regretted leaving behind. Then we moved to Bali. Indonesia, a country famous for its coffee. Bali. Sumatra. Java. The names alone are enough to make a coffee lover break out in rapturous song. Indeed, Dan and I even got up the courage to try the country’s famous Kopi Luwak, the special coffee that Jack Nicholson raved about in The Bucket List. Life is too short to drink bad coffee. After Bali, we moved to Panama, then to Ecuador, both of which grow really good coffee. And the local coffees – the same beans we paid a fortune for back in the states – are incredibly inexpensive and fresher in their homelands. It was such a “no brainer” that I never could understand why anyone would even consider instant coffee. Especially in a coffee-growing nation. That overly-processed powder is a toxic beverage if ever I’ve heard of one. Haven’t Panamanians got any pride? In Panama, Nespresso machines are everywhere, yet I refused to drink that stuff. I could never understand why, with all that fabulous local coffee, so many Panamanian restaurants offered Nespresso. To me, that seemed only one step removed from instant. Shows you what I know. After we got kicked out of Ecuador we ended up back in the US, living with Dan’s mom, a woman so sensitive to caffeine that she only allows herself two cups of decaf a week. Obviously a woman who only drinks two cups a week has no need for a coffee pot. She uses a Keurig, a cute little appliance that makes coffee, tea and hot chocolate one wonderful cup at a time. Just add water, drop in a pre-measured K-Cup pod of your brew of choice, and … Presto! Out comes a fresh, hot beverage, with the same, consistent flavor. Every time. If confession is good for the soul … here are mine. I hope everyone will forgive me. I terribly misjudged all those Panamanian restaurants. It’s not instant Nescafé-type toxicity in a Nespresso machine, it’s real, ground coffee. I was wrong about it not being budget- and environmentally-friendly because those machines come with a little, refillable coffee filter, so you can brew your own at pennies a cup. I also need to confess that we’ve been terribly spoiled by the convenience of having a fresh cup o’ Joe available at the press of a button, whenever we want. We even bought a caseload of K-cups so we wouldn’t run out. Busted. We’ve even talked about buying one. But we won’t. Our rule is, if you buy it, you have to carry it. Try to fit that into a carry-on. 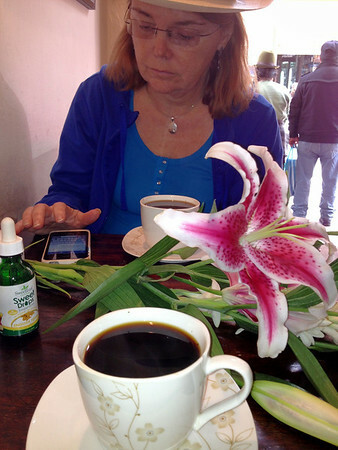 Me, at work in Ecuador, with a fresh brewed cup of the local stuff … as usual. Your coffee habit could pay for your next vacation. You know that, right? Have you notice how many famous coffee establishments – companies like Dunkin’ Donuts and Starbucks – have jumped on the bandwagon and now sell their specialty coffees in K-cups? Even Wal-Mart has a huge selection! These are actually a welcome and more affordable alternative for anyone who’s a regular patron of such places. Here’s what I’m thinking: Quit your Starbucks coffee habit for a month and brew your own. Your savings will pay for that Keurig you've been secretly wanting. Drop the money from your daily coffee habit into an empty jar for one year and you’ll have a nice nest egg for your next vacation. What do you think of that idea? Hey there Linda, some nice tips there and I also have such an addiction. And I am also going to check out that thing about the elephant poop coffee LOL, cant even wait to read it, don’t know – maybe it will be something that I am also willing to try out. Thanks for sharing and keep up the good work here. Hey, Cindy. Not surprised that you’re a coffee fan considering your business, lol. If you try the elephant poop coffee, please let me know what you think. We haven’t tried it yet, but we have tried the civet version, kopi luwak, when we lived in Bali. Have you? IMO it was quite good, but not worth the exorbitant price. Watching them prepare the brew was the best part of the experience. This is a awesome tips for checking the coffee.Appreciate that.I live in Thailand and have a lot of great coffee.Hope you have time for visiting us. Did you know that Thailand markets elephant poop coffee? It seems that the Number 1 most expensive coffee comes from elephants’ “Number 2”? Love the coffee, I can drink it any time of the day I enjoy one after supper and I can even have one before bed. My biggest fear is that I will end up like my Dad, he would be able to have one any time of the day now that he is older he has a hard time having a coffee after lunch. He says that now it keeps him up and has trouble sleeping. The joys of getting older I guess. You’re so right! It smelled and tasted like the most fragrant coffee, but I was distracted because I half-expected to detect the waft of a certain other “aroma” instead. Did you guys go to Australia or New Zealand at all? You’ll be ruined after having coffees there. I brew my own with a drip cup and I buy coffees from roasters that usually come from Central America or Indonesia as well. Not to make you feel worse but they also have a Caramel & Coconut flavor … I think those are the Samoa Girl Scout cookies? Whatever, I sympathize, because when we lived in Bali we couldn’t find cream or half & half anywhere.